The content and graphics of your page are simply beautiful. Its easy to see your site is a labor of love. Please accept my humble award. Again, We Are VERY HONORED! 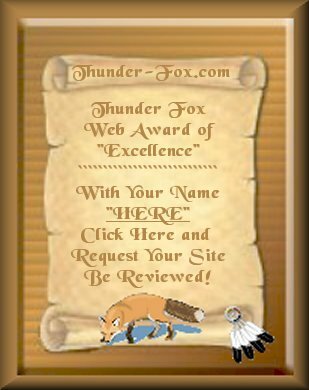 Cherokee Descendant Thunder Fox has been reviewed and chosen to bear the 2001-2002 Golden Web Award. The Golden Web Awards is presented to those sites whose web design, originality and content have achieved levels of excellence deserving of recognition. We are Again, VERY HONORED! Submit Your Site For A Personalized Award! Your site must contain NDN content and useful NDN links! If you would like to have your site considered for this award, click on the graphic above! Sites That Have Requested & Were Awarded! The Guiding Eagles network strives to provide opportunities and incentives to Indian Youth. Our goals are to encourage them to make use of their talents, while learning and participating in their traditions, heritage and languages. To help foster a sense of pride from knowing that their talents and abilities are valued. And involve people and communities from around the country to accomplish this. Guiding Eagles is a 501c3 non profit! You are Our -> <- Guest!